Big News for Llewellyn Fans! As most of you know (unless you missed it), last week I announced not one, but two pieces of good news. The first was that my friend Mindy Klasky and I are going to be putting out a two-book duo of light paranormal novels together this August. (yay!) The second was that I'd just agreed to write another Llewellyn book, The Book of Cat Magic (meow!). Here's what you might win! Your choice of either Wickedly Dangerous (or another one of the series if you already have that one) or Everyday Witchcraft, plus a cool Dangerously Charming notebook, a dragon necklace, and some magnets and bookmarks. Fun, yes? Of course, you could just leave a comment here and get your 3 points for that. Tell me, have you ever read any of the Llewellyn books? (And do you own any?) And are you curious about Witch Ever Way You Can, which was my first novel? So, I promised y'all more good news, and here it is. But there is kind of a funny story behind it, so I thought I'd share. I keep saying I am not going to write any more Llewellyn books, as much as I love them, because the novels take so much of my time now. Then, of course, I came up with the idea of the 365 Day book, which I'm working on now. But that was ABSOLUTELY going to be the last one. Then, towards the end of May, a package showed up in my mailbox. For a minute, I was completely baffled. Elysia knows I'm a cat person. Why on earth would she be sending me a book of DOG MAGIC for my (belated) birthday? My belated birthday card. Isn't it cool? Your crazy-making gift from me is a new book idea--how would you like to write the companion to this book--but The Book of Cat Magic? Isn't it cute? And it's tiny--only 40K words! You know you want to! Please? The really funny part? I had literally said in a conversation with my agent Elaine the day before, "And I'm pretty sure the 365 Day book is the last Llewellyn book I'm going to do." Boy, when the universe laughs at me, it isn't even subtle, is it? Snort. So I called Elaine and asked her if she thought we could squeeze this into my schedule, and she said, "It's the book of CAT magic! You have to write it!" Apparently I'm doing one more Llewellyn book after all. It won't be out until sometime in 2018 (the tarot deck is coming January '17 and the 365 Day book will be out in the fall of '17, probably), but boy, am I going to have fun writing it! I've been working on a sekrit project for ages with my friend, author Mindy Klasky. Mindy approached me with the idea when we were both at the RWA National Convention in NYC last July, so I have kept this under my hat for a LONG time! Today, we finally get to share! 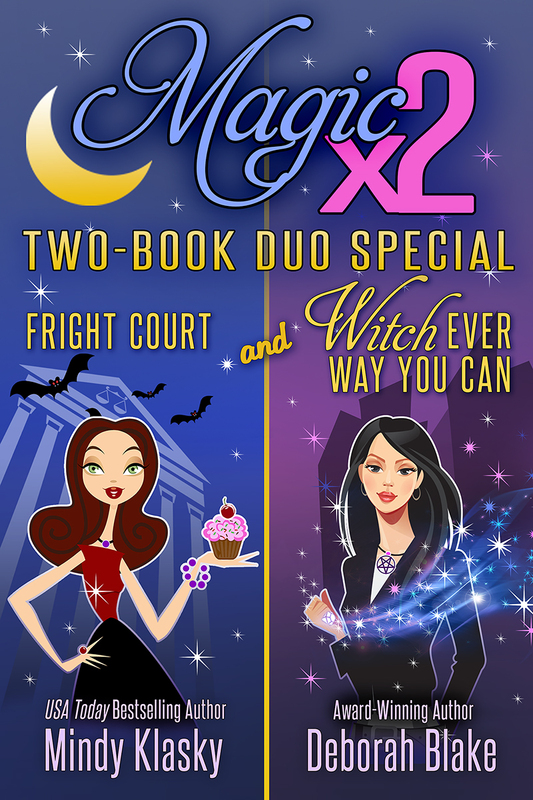 Magic Times Two: Two Books for the Price of One! Magic Times Two will be in stores on August 18. Between now and then, keep an eye out for giveaways from both me and Mindy, plus one BIG joint giveaway on launch day! *Those of you who have been with me since the beginning may recognize this title. It is my first novel, which I briefly had out on its own but took down when the Baba Yaga series came out. Since many of you have asked about it, I decided to release it again, in this special form! As always, you can change any of the elements of this that don't work for you. Happy Summer Solstice! In Wiccan magickal workings, there is a practice known as “Drawing Down the Moon,” in which a witch (usually, but not always, a priestess) channels the Goddess by drawing Her essence into herself. Less common is the practice of “Drawing Down the Sun,” in which a (usually male) witch channels the God. This is not that kind of drawing down the sun. Purpose: This ritual’s focus is on pulling in the power of the sun at its zenith and taking that energy inside yourself, where it will charge your own spiritual battery in preparation for the darker months to come. The ritual is fairly simple, with few tools needed, and is perfect for both the experienced practitioner and one who is new to the path. It can also be converted relatively easily to a group ritual, if desired. Setting: This should be done at noon if possible, on the day of Midsummer. If necessary, it can be done at any point during the day as long as the sun is still shining overhead. If it is raining on the actual day, the energy will still be much the same within a couple of days before and after, although not quite as powerful. 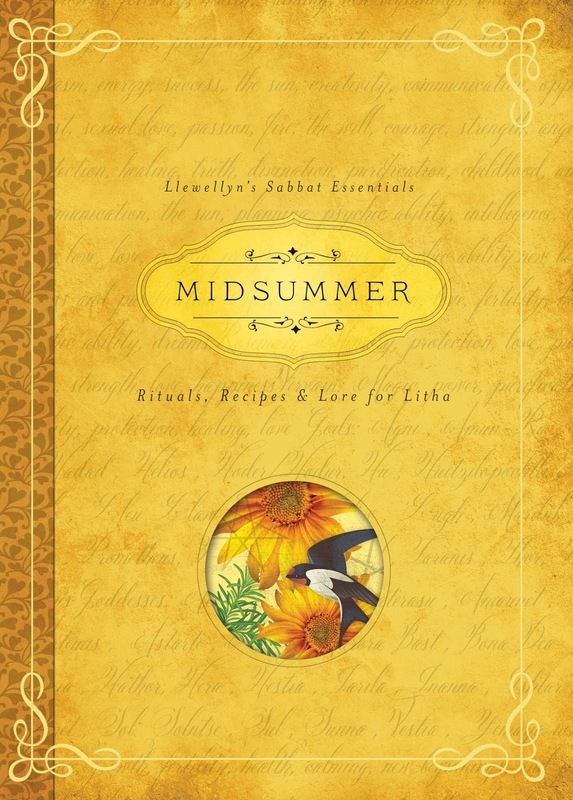 As with most other Midsummer rituals, this one is best done outside, under the sun, preferably in the middle of an open area like a meadow or a yard. It can also be done on a beach, or anyplace where you will be sitting where the sun is shining on you. If you can’t be outside, try to find a spot inside where the sun will fall directly on you while you are doing the ritual, even if that means performing it before or after noon in order to have the sun shining in the right place. Supplies: You need god and goddess candles (gold/silver or yellow/white or white/white) in fire-safe holders, four quarter candles (one each green/yellow/red/blue), a pillar candle to represent the sun (yellow or orange or red). You also need a cast iron cauldron or fire-safe container or candle holder, salt and water in small containers, a small bowl to mix them in, incense or a sage smudge stick in a holder or bowl, wide ribbon in a color that matches your sun candle (if your candle is yellow, use a yellow ribbon, etc.) long enough to tie around your waist, matches, sun-shaped or round cookies for cakes and ale (you can make sugar cookies and coat them with yellow frosting if you want), fruit juice or wine or mead or ale in a chalice or fancy cup. Optional—sunflowers or daisies as an offering for the gods, candle snuffer, athame, broom, or wand, decorative altar cloth, table to use as an altar, blanket or cloth to sit on if you are going to be outside. Notes: While the instructions call for a full ritual set-up, if you don’t have everything listed here, don’t worry. The tools are meant to help you focus, and to heighten the sense of ceremony, and they will probably make your ritual even more powerful. But if you are not in a position to do the entire formal ritual (for instance, if you are not out of the broom closet, and you need something you can do quickly and without being obvious about it), you can do the core section of the ritual on its own. Pre-Ritual Preparations: Place the god and goddess candles on your altar or in the middle of your circle (depending on whether you are using a formal altar or simply placing things on the ground or floor). Put the pillar candle in its holder between them, toward the front of the space, so you can sit in front of it easily, and tie the ribbon in a loose circle around the base of the holder. Place any offerings or decorations on the altar. Quarter candles can be placed on the altar in their proper directions, or at the edges of the circle, with the candle for earth facing north, air facing east, fire to the south and water to the west. Cakes and ale can be placed to the side, where you can reach them when the ritual is nearing its end. The Ritual: Start by cleansing the space and yourself by smudging it with the sage wand (or incense). Walk around the circle clockwise, moving the smoke through the air, and visualizing your ritual area being washed clear of any negativity. Then do the same thing with yourself, starting at your head and working down to your feet. You can leave the sage/incense smoldering in its holder, or put it out. Salt into water, water into salt. Wash away all that is negative and impure, leaving only that which is positive and beneficial. Dab the salt and water mixture on your forehead (for thoughts), lips (for speech), and heart (for feelings). Earth to sky, sky to ground; let sacred space be all around. Visualize your circle filling with white light, enclosing you in a space that is outside of normal time or place. I call the guardian of the east, the power of air, to come to this circle bringing refreshing summer breezes and lightness of spirit. I call the guardian of the south, the power of fire, to come to this circle bringing warm sunlight and a passion for summer joy. I call the guardian of the west, the power of water, to come to this circle bringing life-giving rains and a healing flow. I call the guardian of the north, the power of earth, to come to this circle bringing energy for growth, and the strength of the ground below. Light the green candle. Then, invoke the gods, using the words here or any of the alternatives in the previous chapter. Great goddess, I greet you! You who are known by many names and many faces, shine your divine blessing down on me on this Midsummer Day, filling me with light and love. Great god, I greet you! You who are the lord of the beasts and the fields and the woods, shine your divine blessing down on me this Midsummer Day, filling me with strength and energy. Light the god and goddess candles. 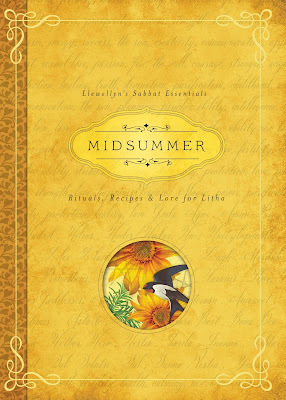 Today is Midsummer and the sun is at its zenith. Its power and energy are all around me. Its power and energy are part of me. I am the fire of the sun. Within this token, I store the power and energy of the sun, that they may carry me through the darker days ahead. I thank the earth for its harvest, and for the bounty it brings to my life. I thank the sun for its life-giving rays that help the harvest to grow, and bring sweetness to this cup and to my life. Blessed lady, blessed lord, I thank you for your presence in my circle here today and in my life always. Snuff out the god and goddess candles. I thank you (insert name of element in the order of: earth, water, fire, air) for watching over my circle and my magickal work. Snuff out the candles after thanking each element. Open the circle by turning counterclockwise and pointing as you turn. Visualize a wall of light dropping down until you are back into your normal life. Take a moment to let it all sink in. You can wear your ribbon all day, or take it off and put it away someplace safe like a box or a bag that can be stored on your altar or in a special drawer. Anytime you feel as though you need an extra boost, you can take it out and either wear it (under your clothes if you choose) or put it in a pocket. 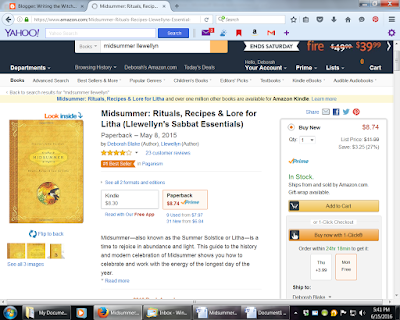 Check out what I found when I went to Amazon to get the link to the book! 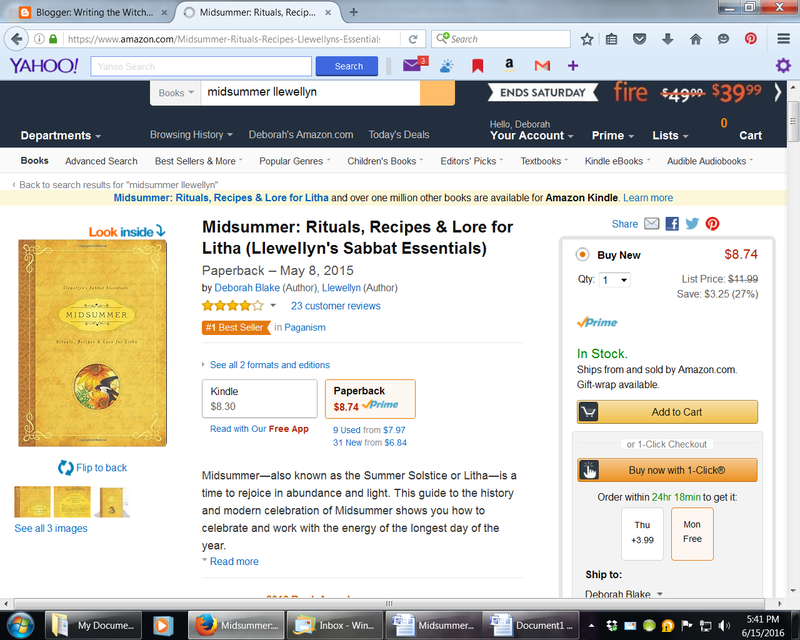 It was #1 Best Seller in Paganism! I figured I'd give y'all a quick update on Angus and Luna. Angus's icky eye is *finally* much better, after four months and three vets. It was probably caused by a virus like the herpes virus that causes cold sores in people, so it may well come back at some point, and I'll still be putting ointment in his eye for a bit, but he is looking (and clearly feeling) much, much better. The right eye (on the left in this picture) was swollen and inflamed. I have mixed feelings about my Luna news. I found someone who is going to try adopting her--a lovely woman who is the friend of a friend, and who lost her own tortie two years ago and has no other cats. She's picking Luna up tomorrow (Saturday) morning. But I have to admit, it is breaking my heart to give her up. I've had her for 15 months, and I am very attached, of course. And when she's not being a holy terror, she is sweet and adorable. But I have to do what is best for her, and having the run of a house and someone to love her all day long will probably make her very happy. We'll see. I've told the woman that if Luna isn't happy, or if the cat drives her nuts, I will take Luna back. At least then I will know that I did everything I could. But I still haz a sad. Luna on "her" stool. You can see the jar of treats where she got on the counter and knocked them onto the floor. In non-cat news, look what I got from Berkley today! I guess I'm going to have to do another giveaway now, huh? I'm looking forward to celebrating the Summer Solstice later this month (it falls on the 20th, which is a Monday, and this year shares the day with a full moon!). It is one of my favorite holidays. So tell me, do you celebrate the summer solstice? I thought it was probably time to give y'all a brief update on the writing. You know, for those who care. The last few months have been a little crazy, what with the whole twisted knee thing, but I managed to type THE END on the polished first draft of DANGEROUSLY DIVINE (Gregori Sun's book), the second book in the Rider's Series (or, as I like to think of it, the fifth book in the extended Baba Yaga series, since it is all a continuation of the story that began in WICKEDLY DANGEROUS ). 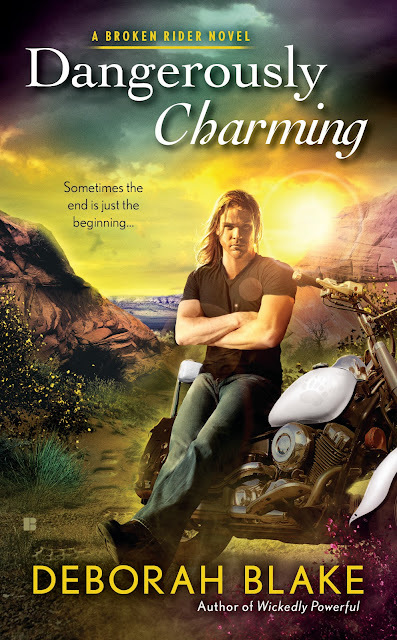 I also completed the proof edits for the first Rider book, DANGEROUSLY CHARMING (Mikhail Day's story) which will be out on October 4th. Just over four months from now! Eek! (Have you pre-ordered your copy yet?) That's the last of the work for that one, except a few giveaways and various promotional stuff when the release date gets closer. You can see from the WIP Progress Meter at the top of the blog (work in progress, for those of you who don't speak writer), I ended up with almost 95,000 words. It will probably be more by the time I finish all the revisions. In case you want a peek into my process, this is a picture of my White Board after I finished the manuscript. You can see that I track my daily word count. In this particular case, I started writing on February 13rd (and did 1,500 words--my average is about 1,000). It took me the first two months to write the first 27,000 words, and then another month and a half or so to do the rest. I had a hard time getting going on this one, in part because the first Rider book tried to kill me. If you take a close look at the upper left hand corner, you can see that that one took me over seven months for the first draft, when my average is about four. OY. In case you were wondering, the picture are the two main protagonists from Dangerously Divine on top (that's Gregori on the right) and the two main protagonists from Dangerously Charming on the bottom. Plus a few misc. notes about things I need to get done. So, that's my update for now. Hopefully I'll be a little bit better about blogging now that I've gotten out of Deranged Writer Mode. Hey, it could happen.